The landscape resonates with the energy of creatures committed to the present task: cicada and butterfly larvae, great-horned owls and coyotes; some dormant in winter, some busy outwitting summer's scalding Sun and short night. Their existence is free of the riddle of existence, of melancholic musings over their mortality. They aren’t mesmerized by metaphors. They are metaphors. A coyote seeks shade on a sizzling summer afternoon in Murphy Meadow, Round Valley Regional Preserve. Coyote track, Los Vaqueros Watershed. A volt of turkey vultures, Round Valley Regional Preserve. Tarantula, Mt. Diablo State Park. Tarantula hawk, Los Vaqueros Watershed. Northern Pacific rattlesnake, Mt. Diablo State Park. Coyote pup on the banks of Marsh Creek in Round Valley. Spider crab, Mt. Diablo State Park. A monarch caterpillar enjoys a milkweed breakfast in Round Valley Creek. Gopher snake, Mt. Diablo State Park. Adelpha californica, Olympia Trail, Mt. Diablo State Park. Mule deer, Point Lobos State Reserve. Deer track, Los Vaqueros Watershed. Bobcat track, Black Diamond Mines Regional Preserve. 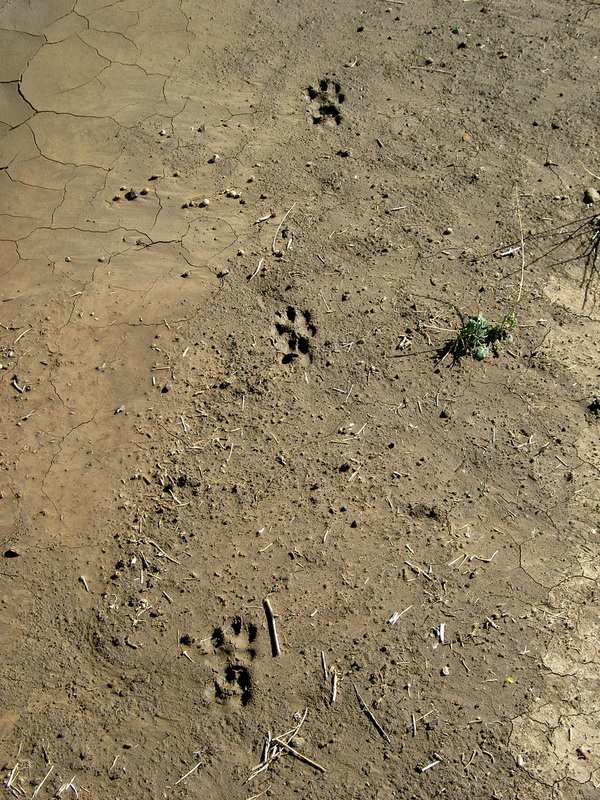 Bobcat track illustrates “diagonal walking.” The left hind paw (lower track of bottom pair) and right front paw (upper track of middle pair) hit the ground at the same time. Then the bobcat's right hind paw (lower track of middle pair) and left front paw (upper track of top pair) hit the ground at the same time. A sparrow perches on nightshade along the Embarcadero, San Francisco. Wild turkeys, Round Valley Regional Preserve. Raven, Round Valley Regional Preserve. Ladybug on Ithuriel's spear, Round Valley Regional Preserve. Great blue heron, Marsh Creek Trail, Oakley.